Media Relations: We may provide your name, address, email, phone number and photos of your house to the radio / TV or print media to recognize your display and for their use and "publication". Information and Accuracy. While Utkaduck Design - California Christmas Lights attempts to convey accurate and current information on this site, the information provided on this site may contain typographical or technical errors. You are advised to confirm that the accuracy of any information presented at this site before relying on it in any way. INFORMATION ON THIS WEB SITE IS PROVIDED "AS IS" WITHOUT WARRANTY OF ANY KIND, EITHER EXPRESS OR IMPLIED, INCLUDING, BUT NOT LIMITED TO, THE IMPLIED WARRANTIES OF MERCHANTABILITY, FITNESS FOR A PARTICULAR PURPOSE, OR NON-INFRINGEMENT. Products and Services. Information in this document and Utkaduck Design - California Christmas Lights products and/or services may be changed or updated without notice. Some products and services may only be available in the United States and its territories. No Liability. IN NO EVENT WILL Utkaduck Design - California Christmas Lights BE LIABLE TO ANY PARTY FOR ANY DIRECT, INDIRECT, PUNITIVE, SPECIAL, INCIDENTAL OR OTHER CONSEQUENTIAL DAMAGES ARISING DIRECTLY OR INDIRECTLY FROM ANY USE OF THIS WEB SITE, EVEN IF Utkaduck Design - California Christmas Lights IS EXPRESSLY ADVISED OF THE POSSIBILITY OF SUCH DAMAGES. Trademarks. Utkaduck Design, the Utkaduck Design logo, and other names, logos, icons and other marks identifying Utkaduck Design, products and services referenced herein are trademarks of Utkaduck Design and may not be used without the prior written permission of Utkaduck Design. Certain service agreements permit merchants and others to use certain of the trademarks for limited purposes. All other product or company names referred to herein are trademarks of the respective owners. California Christmas Lights, the California Christmas Lights logo, and other names, logos, icons and other marks identifying California Christmas Lights, products and services referenced herein are trademarks of Utkaduck Design and may not be used without the prior written permission of Utkaduck Design. Certain service agreements permit merchants and others to use certain of the trademarks for limited purposes. All other product or company names referred to herein are trademarks of the respective owners. Copyright Notice. This web site is subject to the protection of the copyright laws of the United States and other countries. You may not reproduce any part of the California Christmas Lights web site without the prior written permission of Utkaduck Design. Products and companies referred to herein are trademarks or registered trademarks of their respective companies or mark holders. Use of Utkaduck Design Services and Software. Utkaduck Design SOFTWARE AND SERVICES MAY ONLY BE USED FOR LAWFUL PURPOSES. If any Utkaduck Design software or service is used in violation of any law or regulation or in a manner that may cause Utkaduck Design to be subject to investigation, prosecution or legal action, Utkaduck Design may exercise its rights under the appropriate service agreement and/or software licenses to terminate service. Users of Utkaduck Design services and/or software accept the risk that their service may be interrupted if legal challenges arise as to their use of the service. Data Collection. We make every effort to honor the preferences of our Web site users concerning the collection and use of personally identifiable information. In general, when you visit our family of Web sites & access information, you will remain anonymous. We limit the information we collect from you to only what we need to conduct business and to offer products and services that you might be interested in. In an off-line transaction you may elect to provide us with information such as name and email address. We will use your personally identifiable information to contact you the following year to determine your interest in having your house displayed on this Website. We may share your name, address and photo of your display with the media: radio, TV or print. In addition to information you provide, we may collect information about your anonymous use of our Web sites that will help us improve our online services, such as information regarding what pages you access on our sites, what URL you just came from and the URL you next go to, what browser you are using and your IP address. This type of information collection is an industry standard and the information collected will be used to analyze trends and statistics and monitor link usage. Data Security. We use industry standard efforts to safeguard the confidentiality of your personally identifiable information. Unfortunately, it is impossible to absolutely guarantee the security of data transmission over the Internet or any wireless network. Therefore, although we take reasonable measures to protect your information, we cannot ensure the security of any information you provide to us and you do so at your own risk. Comments & Submissions. Any comments regarding this Web site or any other Web site owned or operated by Utkaduck Design and/or information, house submission or related materials (including photos, text descriptions, etc) sent to Utkaduck Design - California Christmas Lights become the property of Utkaduck Design - California Christmas Lights and may be used by us without liability and for any purpose without compensation or attribution to the sender. Utkaduck Design may reproduce, use, disclose, exhibit, display, transform, create derivative works and distribute such content or materials to others in any media or format without limitation. Links to other Sites. 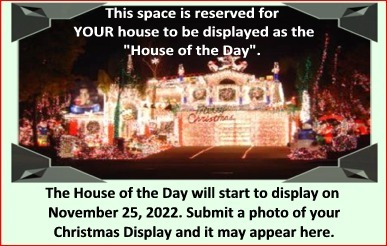 Information Utkaduck Design - California Christmas Lights publishes on the World Wide Web may contain links to other sites. Utkaduck Design makes no representations whatsoever about any other web site that you may access through this site. Unless expressly stated in writing, Utkaduck Design does not endorse the products or services offered by any company or person linked to this site nor is Utkaduck Design responsible for any software or the content of any information published on the site of any other party. You should take precautions when downloading files from sites to protect your computer software and data from viruses and other destructive programs. Through our web pages, you may connect to third parties' web sites via hyperlinks, and the connections may or may not be obvious. We are not responsible for the collection, use, maintenance, sharing, or disclosure of data and information by such third parties. We encourage our users to be aware of the varied privacy policies of web sites that they visit. Users Under 13. This Web site is not directed at children under the age of 13. If you are younger than 13, please do not provide any personally identifiable information in connection with your use of the Web site.